You Don’t Have To Wear Helmet, But Should You? 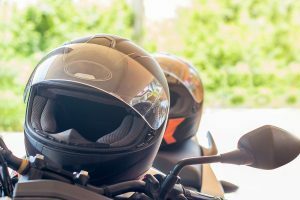 Unlike other states in the country, Florida does not have a “universal” helmet law for motorcyclists that requires them to wear a helmet at all times while on a motorcycle. It’s easy to see why motorcycle enthusiasts in Florida wouldn’t want to. With some of the best weather in the country, as well as scenic, open roads, wearing a helmet can—similar to being in a car—make a person feel cut off from the environment he or she is in. And since the point of a motorcycle is to be fully immersed in the environment while riding, helmets may seem counter-productive. It’s for this and other reasons that the state of Florida has put certain conditions in place that allow motorcy-clists—if they so choose—to ride a motorcycle without a helmet, or legal ramifications. But of course, not wearing a helmet means that the rider is exposed to more risk of physical injury. Or is this really the case? Let the statistics speak for themselves. Of course, any kind of safety mechanism is not a guarantee of absolute protection, but it is a significant factor in reducing the risk of injury, serious and otherwise. A motorcyclist is already exposed to a greater degree of injury simply because, by not being in a car with air bags, an enclosure, and seatbelts, any impact is likely to throw the rider from the motorcycle. So where do helmets come in then? One of the chief functions of a helmet is to prevent traumatic brain injury or TBI. The head contains some of the most important organs in the human body, including the ability to see, hear, speak and, of course, think and feel thanks to the brain. Wearing a properly constructed motorcycle helmet can reduce the chances of a fatal head injury by as much as 40%, and can reduce the chances of injury in general by as much as 70%! This is backed up by the sobering statistic that of the motorcycle related deaths that occur in Florida, 59% of those involve someone not wearing a helmet. The important thing for a motorcycle helmet is that it is constructed specifically for that purpose. Putting on a football or hockey helmet is not the same thing, and serves a different function. Motorcycle helmets need to be light but dense, with an outer surface made from some kind of fiber-reinforced composite materials, like poly-carbonate. Helmets should also be lined with some kind of effective shock-resistant material to help absorb the forces of impact. Styrofoam is actually one of the best inner linings in the industry to achieve this goal, which is why it’s also so prevalent as a packing material for delicate goods. And finally, the helmet must be secure. This means that padding is within the helmet itself to keep it comfortable and snug on the head, while a chin strap is present to make sure it remains on the head ever after extreme movement. Motorcycle accidents can be very serious and have their own legal complications, so make sure you talk to a car crash lawyer about your options.